Kareem Abdul Jabbar spoke at the DNC last night, primarily to introduce the story of army Captain Humayun Khan, who was one of 14 Muslim-Americans who have died in combat since 9/11. Khan's father later spoke movingly of his son's sacrifice and his devotion to American ideals. As an advocacy teacher, I feel the need to analyze the joke for effectiveness (yes, I realize that is like dissecting a frog, which is why I saved my comments until after the video). First, it is obvious that the joke was a big hit with the people in the room, who erupted in laughter and applause. Like most good jokes, it took a beat before the audience realized what Abdul Jabbar was implying. Then, the shared "aha" moment made it all the more enjoyable. The joke also worked because it was delivered in a deadpan by a much admired figure. A snarkier or more confrontational tone might have caused it to fall flat, even in a room full of Trump detractors. For maximum impact, it had to be delivered with a slight tone of regret, rather than outright accusation. But how did it play at home? Did Clinton supporters have the same reaction when watching on television? Were independents or undecided voters at all swayed? Did Republicans see any humor in it, or did they react only with outrage? My sense is that the joke was extremely effective in further "defining" Trump in a negative light. Given that defining your opponent is often the key to a successful campaign -- a tactic taken to new heights, or lows, by Trump himself -- I think that the video worked very well. Still, I am not an objective observer. What do others think? I had the exact reaction as the audience, but I'm definitely in the Clinton camp already. When I was in law school, many of my nonwhite friends complained about how professors confused all the black women in our class. As a professor, I take pains to learn the names of the nonwhite students as quickly as possible - obviously I don't want to call any student by the wrong name, but there is a different valence to it when the student is nonwhite. A different "valence" indeed. What a nice way of putting it. 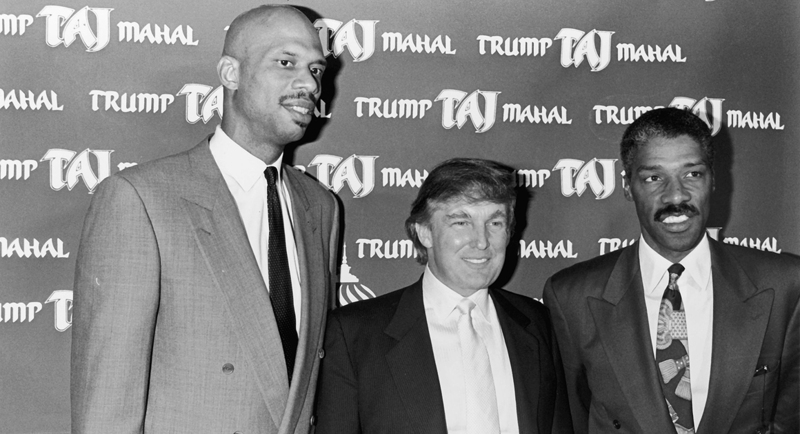 As for Kareem, anyone who knows, over the years, would not find his "joke" remarkable or unusual. It meant nothing to anyone, and will have no impact on anyone, other than the partisans and cheerleaders who applaud such things because they are projecting hate not avoiding it. OMG anon. My face is red for you, as you cannot see how embarrassingly clueless you are. For what it's worth, I've heard that Kareem is a real jerk in person. That's what I was alluding to by : "As for Kareem, anyone who knows, over the years, would not find his "joke" remarkable or unusual." Last night, I can't remember whether it was Brian Williams, or one of the other obsequious toadies on MSNBC who declared that he could think of NOTHING about the DNC that could have better, explaining that it was basically PERFECT in every way. This is so disturbing, because their seeming ignorance of the hypocrisy they endorse demonstrates that intellectual honesty, claimed so often by the Party to condemn all those who do not swallow the Party line whole, is a mirage when it comes to zealots. At least in the party of the Evil Ones, there is enough integrity in the leaders to reject a nominee, even at the potential cost of an election. You'd never see that among this group. They can't bring themselves to admit even the most obvious truths. The whole post is reeking with statements that could only be made and believed by persons isolated in a very tightly sealed bubble, into which no information about the real world is permitted. "a scathing jab at Donald Trump," "Like most good jokes," "The joke also worked," "a much admired figure," "For maximum impact, it had to be delivered with a slight tone of regret" "My sense is that the joke was extremely effective in further "defining" Trump in a negative light," etc. Lubet just loved it. Let's pause. Kareem basically played on the "white people think we all look alike" meme, i.e., white people are racists. A comment above validated that inference. Sure, Steve might respond that Kareem was just talking about Trump. Sure. Sure. What Lubet and others who share his views consistently miss is the way they consistently miss their own hypocrisy. This "joke" wasn't funny and will have ZERO effect. None. But, enjoy it, Steve! It's so fun to malign and hate others, isn't it? And to believe that your representative has done so in a clever manner? You are sooooo different from Trump supporters. So different! Didn't you just love the endless repetition about how mean and divisive Trump is? Oh, and by the way, Steve, did you wipe away a tear when all the stuff about "one America" was delivered so convincingly? Are the self righteous self righteous because they actually are better than everyone else who doesn't adhere exactly to their dogma? Or, because they just think so? See how that works? Partisans and cheerleaders applaud comments like yours because they are projecting hate not avoiding it. I'm not a fan of either Trump or Clinton. The joke comes off as strange to me. Trump's racism against blacks hasn't been a central theme against him, has it? I haven't seen it come up that much. I'd more understand a joke related to his views against Hispanics or Muslims. So the joke for me just seems strange (although not enraging).